During the Month of February and into March, students continued to "play" with STEAM centers during library class. From the Marble Maze and Gears, as well as learning the basics of robotics and coding with the mouse, provided through a PTA Grant, to building with Tangrams, Lincoln logs and legos, the students really enjoyed creating and experimenting. Students also participated in coding and programming activities in computer lab. Beginning with First grade, we use Tynker online coding game, Second and Third grade used Kodable, Fourth grade used Hour of Code and will move into Ozobots. Fifth and Sixth graders were working on Scratch Projects (https://scratch.mit.edu), with a few ambitious students opting to try Python Coding Language. I hope to wrap these up soon and put them on the website. I am learning so much from your students as we work through programming problems!! And we are having alot of fun!!! Please ask your students to share what they are doing in class! In the days before break, the library broke out some of our new STEAM "toys." Thank you to BKW PTA who provided a generous grant to purchase some of these hands-on STEAM experiences for our students. The mouse coding game and the Ozobots were a big hit (Even with Mrs. Malone)! In computer class we dove into Coding with Kodable and Hour of Code as well as some programming with Scratch. The STEAM activities will continue for the rest of the month of February! In the week before the holiday break, third and fifth grade participated in a collaborative science mystery room, inspired by the book The Case of the Vanishing Golden Frogs: A Scientific Mystery by Sandra Markle, and organized by Mrs. Keller-Baker and the school library program. The third grade had been learning about frogs and the fifth grade about ecosystems, and both grades were able to use what they are learning in science to help them solve a mystery rooted in science. The students worked in mixed grade level teams to observe a fake crime scene showing a large portion of (what they later learned were) Panamanian Golden Frogs dying in their native habitat. The third and fifth grade teachers stepped in to play the part of different scientists that the students could consult for more information to help them determine what is killing off the species of frogs. The students started to raise questions about how the frog's habitat might have contributed to their deaths. They were able to examine evidence at each of the scientist's stations and look at their hypotheses. We were fortunate to have guests, Mrs. Davis, our High School librarian, Mrs. Landry, our principal, and Mrs. Gebhardt, our guidance counselor, step in to play the roles of the Aquatic Fungi Specialist, giving our students the answer to what is killing this and other populations of frogs. The kids really enjoyed this unique learning experience! The library program has been able to make a connection with one of the research program dedicated to conserving this species, the Smithsonian Center for Species Survival, and BKW alum and Ph.D. candidate in the Cornell-Smithsonian Joint Graduate Training Program, Alyssa Wetterau. She has generously agreed to arrange several video conferences with our students to follow up on the Panamanian Golden frog status. We look forward to making these arrangements and extending this learning activity. In the first weeks of December, many in the school join the International Hour of Code Movement. In Library class, Kindergarten received an introduction to coding with a screen-free coding activity for Brown Bear, Brown Bear What do you See? In computer class, first grade began coding on Tynker, Second and Third grade are coding using Kodable, and grade 4-6 used the Hour of Code website. I challenged Fifth and Sixth grade to try some of java script or Python coding language. After the new year, We hope to introduce Scratch to grade four and up and have some sixth grade working to learn Python. 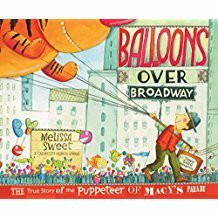 In preparation for the Thanksgiving Holiday, most of the 3rd grade classes read the book ​Balloons Over Broadway:The True Story of the Puppeteer of the Macy's Day Parade, a biographical picture book about Tony Sarg. They learned about his inspiration for the large balloons, the Indonesian Rod puppet, and made a version of their own. In computer class they explored a 360 degree view of the Macy's Parade attractions and route. They saw visuals of the parades of years past dating back to the first parade in 1924. They really enjoyed exploring the website and were excited to watch the parade at home.